Today, when building and truing wheels we are standing on the shoulders of past bicycle inventors. The discovery of the wheel was necessary before anyone could think about riding on two wheels. Today's modern bicycle owes its existence to inventors who started making and changing bicycles about 150 years ago. The early inventors were not mechanical engineers or physicists. They were more like tinkerers, figuring out how things work and trying to find ways to improve them. But even they started out with wheels that had been around for centuries. The invention of the wheel is often referred an event that changed history. If that actually was the case, the innovation changed history a very long time ago. Historians estimate that the first vehicle wheel originated in Mesopotamia around 3,500 BC. The spoked wheel on a horse drawn chariot would eventually modernize warfare in around 2000 BC . Close to 200 AD the wheel was used in a wooden wheel barrel during the Han Dynasty in China. Skipping ahead all the way to 1800 AD, G. F. Bauer invented the tensioned wire spoke wheel about 50 years before the invention of the bicycle. This is often an underappreciated aspect of bicycle history. 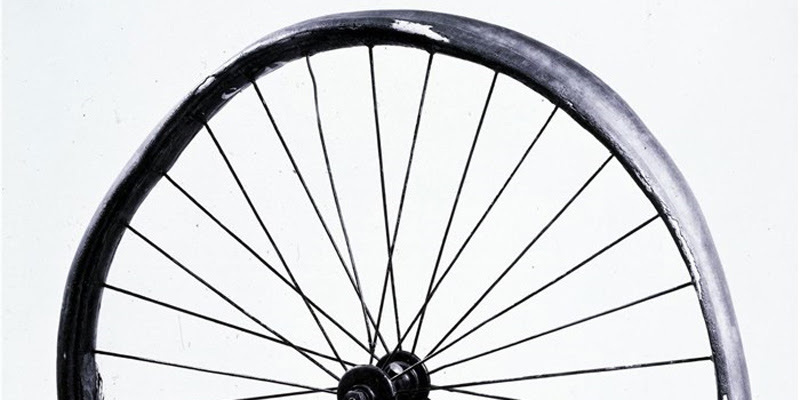 The tension-spoked wheel would eventually would become a way to reduce the weight of wheel. Several modifications would be necessary before this innovation found its way into the precursor of the modern bicycle wheel. The innovation did really take hold right away. The popular pedal powered bicycles was not invented until the early 1860s. Previously bicycles were more for scooting along powered by your feet on the pavement. In the picture below the new development was the pedals are attached directly to the front wheel. Riding such bicycles weighing over 65 pounds with wooden wheels and spokes must have been quite a challenge. The tires on these bicycles were nothing more than metal tacked onto a wooden rim. No wonder such classic bikes of this era were called "Bone Shakers." 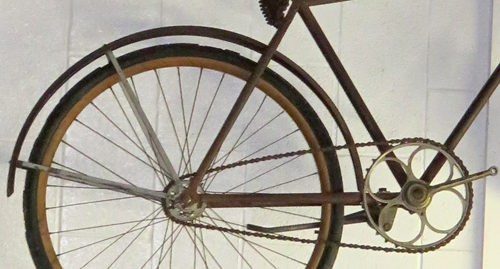 In the mid to late 1800s both wheel and bicycle design innovations began to come fast and furiously. Despite the earlier innovations, the spoke wheel did not revolutionize the bicycle industry until the mid-19th Century. Herlihy (2004) in his book Bicycle: The History indicates that "Eugene Meyer of Paris ... in 1869 patented a system featuring individually adjustable spokes. Meyers' own wire-wheel bicycles weighed just forty four pounds, easily twenty five pounds lighter than a standard velocipede with wooden wheels." Most wheels during the 1850s to 1870s were radial designs. James Starley an inventor in the United Kingdom was the first to patent the tangent spoke designed wheel in 1874 (Grace's Guide to British Industrial History 2015). 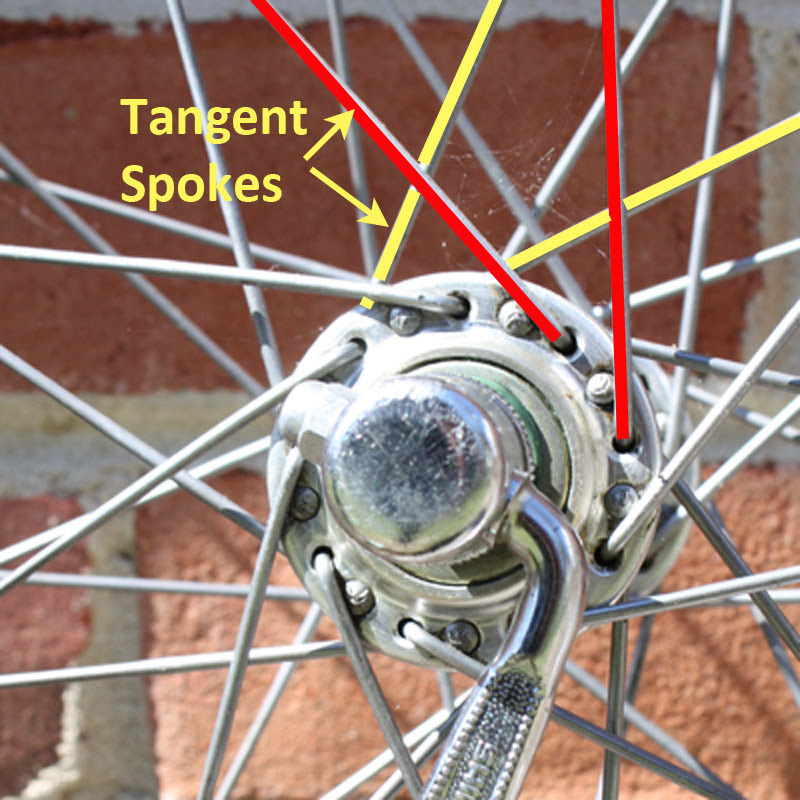 For his invention the spokes ran as a tangent to the hub, crossed each other and were laced to improve strength. This design was repeated on both sides of the rim. Today this inventions is still the basis of wheel design. A slightly modified version of this tangent spoke design is the key to the stiffness and durability of everyday bicycle of wheels. The tangent spoke is still in use today. It is the key to making bicycle wheels lighter and improving their strength for withstanding bumps and potholes. Look out for the new Pneumatic Safety (bicycle). Vibration impossible! (Emphasis added). After some trial and error Dunlop patented the idea in 1888 and started to produce the predecessor to the modern bicycle tire in Dublin for cycle racing. For the bicycle, it (the pneumatic tire) was the last piece of the jigsaw. The steering system meant you could balance on two wheels in line; the diamond shaped frame and same-sized wheels made the machine strong and safe to ride; the drive chain made it efficient. And, finally, Dunlop made the bicycle comfortable... The pneumatic wheel made the bicycle popular. In the late 1800s and the early part of the 1900s the bicycle continued to develop and evolve. In an era just before the car became popular, it was bicycle associations such as the League of American Wheelman that advocated for better roads and streets. During this same era the Wright Brothers, well know bicycle inventors, used tensioned wires and other bicycle innovations to build the first airplane. Herlihy (2005 p. 6) observes that the Wright Brothers used bicycles "to conduct their first wind tunnel experiments and the build the 1903 Wright Flyer in their workshop using familiar tools and materials." Thus, one should consider the bicycle as a product the new industrial era. Since the use of tangent spokes and the pneumatic tire the bicycle wheel has been refined, but the basic design has not changed. New materials such as alloys and carbon fiber have been used for the rims. The spokes also have evolved from soft steel to stainless steel to carbon fiber. However, the methods of lacing the wheel were pretty well established in the early part of the 20th Century. The bicycle wheel now has been around for centuries and it is only gradually being integrated into the new electronic world through the use of cell phones, GPS systems and wireless components. Grace's Guide to British Industrial History. 2015. "The Life Inventions of James Starley." Abridged. gracesguide.co.uk. London. Material originally published in Bartleet's Bicycle Book. London: E. J. Burrow & Co. Ltd. 1931. National Museum of Scotland. 2017. "Dunlop Tyre." Edinburg, Scotland, Accessed 2017. Thanks for this enlightening piece of work.